Philadelphia Magazine published an article called “Pets: The Complete Guide to Philly’s Best Dog Parks” in which they named the ten greatest dog parks in Philadelphia. One dog park stands out above the others on the list—Schuylkill River Park Dog Run. This park is described in the article as “the fanciest of all of Philly’s dog parks” because of its $14,000 drinking fountain, sections for both large and small dogs, and best of all the features, the K9Grass artificial turf surfacing. 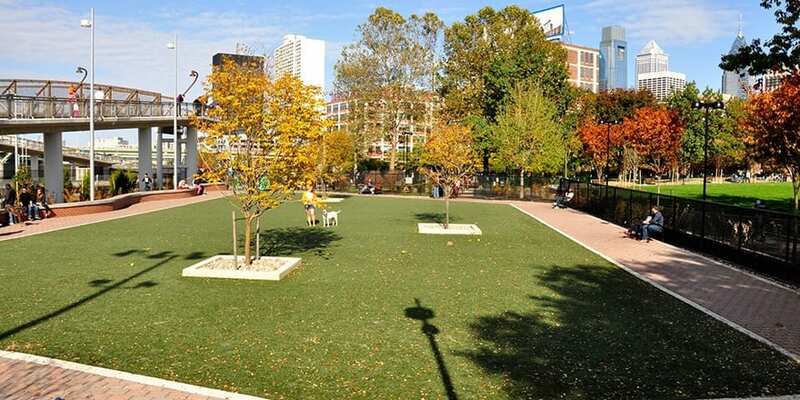 ForeverLawn has aided in the transformation of so many dog parks and other types of pet facilities with K9Grass, and it seems Philadelphia has fallen in love with the transformation at Schuylkill River Park Dog Run. K9Grass offers superior drainage that other types of surfacing materials like wood chips or concrete don’t. Owners that bring their dogs to the park are thrilled about leaving with dry paws, as opposed to the muddy, wet paws that they are used to at other parks or at home. Rather than trying to grow and maintain natural grass, a nearly impossible task with so many dogs running around, dog parks like this one are improving the appearance of community areas with lush and green K9Grass. Not only are these areas more appealing to dogs, but their owners love the fresh smell, too! To learn more about the best dog parks in Philadelphia, read the full article from Philadelphia Magazine.